North Bay, Ontario in the winter... so yes, it was it cold. Let's just get that out of the way right at the beginning. And it wasn't just the cold, we got a bit of a storm on their wedding day (the limo ride to the church was... interesting). We began the day at Jayde's hair salon in North Bay, Vida Salon, and then the girls headed back to Jayde's house for the makeup and finishing touches. After a quick visit to the guys at David's father's beautiful home (that he built himself!) I joined the girls and we all piled into the limo for the snowy drive out to the little town of Bonfield. Jayde grew up in Bonfield along with some of her bridesmaids and her parents still live there. It was a beautiful old church of Ste. Bernadette Parish, really interesting to see how French churches in Canada have a very distinctive look compared to English churches of the same age. After the church ceremony we all headed back into North Bay and Jayde had arranged for us to use the historic Capitol Theatre for some portraits. The reception was held at the historic http://clarion-resort-pinewood-park-north-bay.hotelmix.co.uk resort and the cocktail hour featured an amazing spread put on by David's cousin who happens to be a great chef! Jayde and her sister own an amazing dance studio (that they run when they're not busy being teachers and nurses) and some of Jayde's students surprised her with dance-mob (is that a word?) during the wedding reception. The look on Jayde's face was priceless as she fought to hold back the tears. David's grandfather sings with a group of guys in their church and they entertained the guests with a couple of really touching Italian songs. The rest of the night was filled with some really heartfelt speeches. A really special moment for me was when David danced with his sister in memory of their mother who had passed. I caught their father looking on and it's one of my favourite images from the night. 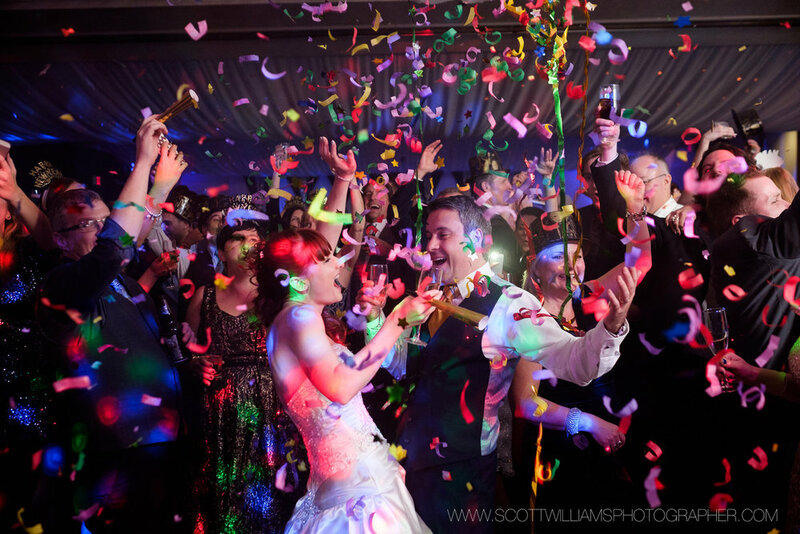 As the clock ticked down to midnight, we all gathered on the dance floor confetti guns, hats and whistles at the ready! You can check out some of my favourite wedding photographs above and a full slideshow of wedding photographs below!